The Gashaka Primate Project at Kwano is run by Professor Volker Sommer at UCL. For the past 9 years, the Prof has built up a base for researchers from all over the world to study the remaining colony of 2000 chimpanzees. Our closest genetic ancestors are gradually dying out in the park, thanks to poaching and loss of habitat. 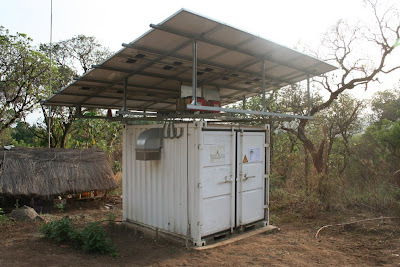 Here is the solar-power unit which provides off-grid electricity for the station.